James William Slessor Marr (9 December 1902 – 30 April 1965) was a Scottish marine biologist and polar explorer, renowned for his role as the leader of Operation Tabarin. Marr was born in Cushnie, Aberdeenshire, Scotland, on 9 December 1902. Son of Farmer John George Marr and Georgina Sutherland Slessor. While studying classics and zoology at the University of Aberdeen, he and Norman Mooney were selected among thousands of Boy Scout volunteers to accompany Sir Ernest Shackleton on the Shackleton–Rowett Expedition in 1921, on board the vessel Quest. 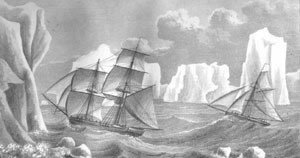 The expedition failed to reach its final objective the Weddell Sea due to Shackleton's death on 5 January 1922. Upon his return Marr completed his MA in classics and BSc in zoology. In between he had to participate in fund raising events that were organised in order to cover the expedition's debts. Which included standing in scout uniform outside cinemas where the film Quest was being shown. Marr spent 1926 as a Carnegie Scholar at a marine laboratory in Aberdeen. He took part in the British Australian and New Zealand Antarctic Research Expedition (BANZARE) with Sir Douglas Mawson. He went on to become a marine biologist, taking part in the Discovery Investigations (1928-1929, 1931-1933 and 1935-1937) specializing in Antarctic Krill. In 1943, Lieutenant Marr was promoted to Lieutenant Commander, taking over the leadership of Operation Tabarin during World War II. It was a secret British Antarctic launched in 1943 with the intent of establishing permanently occupied bases, thus solidifying British claims to the region. Marr led the overwintering team at Port Lockroy in 1944 and leaving for home in December due to poor health. In 1949, he joined the National Institute of Oceanography as a Senior Scientific Officer working there until his death on 30 April 1965. His 460 page work Natural History and Geography of Antarctic Krill was published three years after his death. Mount Marr in Antarctica, was discovered in January 1930 during the course of BANZARE and subsequently named after Marr. 7 October 1941 - Clasp to the Polar Medal (Bronze) - for good services between years 1925-1939, in the Royal Research Ships "Discovery II" and "William Scoresby": James William Sleesor Marr, Esq., M.A., B.Sc. (now Temporary Lieutenant, R.N.V.R. ), H.M. Ships Discovery II and William Scoresby. 30 November 1954 - Polar Medal - For good services with the Falkland Islands Dependencies Survey in Antarctic expeditions: Temporary Lieutenant-Commander James William Slessor Marr, R.N.V.R., Base Leader, Port Lockroy, 1944. ^ a b Haddelsey 2014, pp. 31–35. ^ Haddelsey 2014, pp. 223–224. ^ "Mount Marr". Geographic Names Information System. United States Geological Survey. Retrieved 12 August 2013. ^ "No. 35300". The London Gazette (Supplement). 7 October 1941. p. 5785. ^ "No. 40339". The London Gazette (Supplement). 30 November 1954. p. 6790. Haddelsey, Stephen (2014). Operation Tabarin : Britain's secret wartime expedition to Antarctica, 1944-46. Stroud, UK: The History Press. ISBN 978-0-75249-356-5. Commander John Robert Francis Wild,, known as Frank Wild, was an explorer. He went on five expeditions to Antarctica for which he was awarded the Polar Medal with four bars, one of only two men to be so honoured, the other being Ernest Joyce. Port Lockroy is a natural harbour on the north-western shore of Wiencke Island in the Palmer Archipelago in front of the Antarctic Peninsula. The Antarctic base includes the most southerly operational post office in the world. Scouting in the Antarctic is maintained by a single troop of Argentinian Scouts and also by visiting Scouts from other nations who are participating in expeditions and research projects. Leonard Duncan Albert Hussey, OBE was an English meteorologist, archaeologist, explorer, medical doctor and member of Ernest Shackleton's Imperial Trans-Antarctic and Shackleton–Rowett Expeditions. During the latter, he was with Shackleton at his death, and transported the body part-way back to England. Elke Mackenzie, born Ivan Mackenzie Lamb, was a British polar explorer and botanist that specialized in the field of lichenology. The standard author abbreviation I.M.Lamb is used to indicate this person as the author when citing a botanical name.